This mouth-watering zucchini bread recipe is one you’ll want to use over and over again! 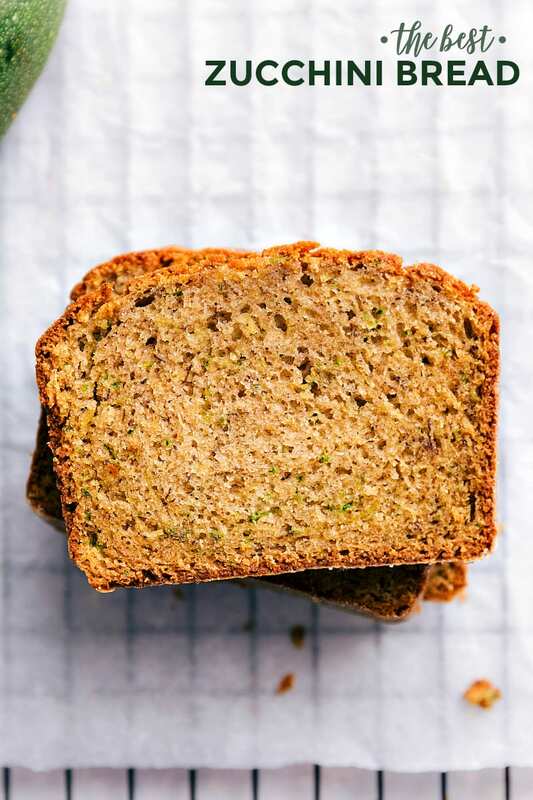 This zucchini bread recipe is quick, simple, foolproof, and insanely tasty! I’ve included a variation below to make chocolate chip zucchini bread with this recipe, and if you’re craving more variations, you’ll have to try this lemon zucchini bread or this chocolate zucchini bread. If you’re looking for a healthier option, check out this healthy zucchini bread. It’s taken me a while to post a zucchini bread recipe on my blog. 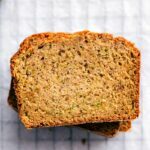 And for good reason too – there are literally hundreds of zucchini bread recipes already online, and I didn’t feel I had a recipe that stood out from the rest. Until now. After much trial and error, I can confidently say this is the best zucchini bread recipe I’ve ever tasted, and I’m so excited to share it with you today! Zucchini bread is not a difficult bread to make but the results speak for themselves. Here’s a quick overview of the process, with more detail in the recipe card below. Lightly grease and flour two bread pans and set aside. Beat the wet ingredients together: the sugar, eggs, and oil and mix well. In a separate bowl combine the dry ingredients: flour, baking soda, baking powder, salt and cinnamon. Slowly add the dry ingredients to the wet ingredients and beat until just combined. Over mixing will result in a denser bread. Stir in the shredded zucchini and vanilla. Pour the batter into the prepared bread pans. Bake for 55-60 minutes or until a toothpick comes out clean when inserted into the center. Simply add 1 cup semisweet or milk chocolate chips (we like milk chocolate best!) to the batter. Make sure to toss the chips in the dry ingredients first to get an even dispersion in the bread. No other modifications to the recipe needed! Spray and lightly flour a muffin tin. Fill the cavities slightly higher than half-way. Test with a toothpick to make sure the center of the muffins are done (if it comes out clean or with moist crumbs, the muffins are done; if it comes out wet they need a few extra minutes). No, you do not need to peel the zucchini! The skin adds to the texture of the bread, and once cooked into the zucchini bread, you won’t be able to taste it. The skin also adds nutrition to this bread! Cut off both ends of the zucchini. 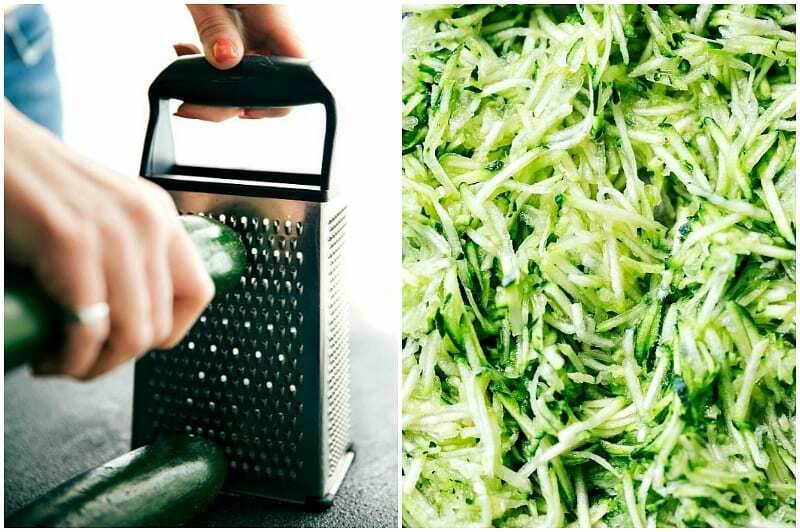 If using a large zucchini, first cut the zucchini in half horizontally. Take each half (or 1 small zucchini) and grate it for this bread. Let the bread cool completely. Make sure to enjoy the bread within 2 months. You can also freeze shredded zucchini in a freezer bag so you have zucchini on hand whenever you want to make this easy bread recipe! This mouth-watering zucchini bread recipe is one you'll want to use over and over again! Preheat the oven to 350 degrees F. Beat the sugar and eggs until well incorporated. Add in the oil and mix well. In a separate bowl combine the flour, baking soda, baking powder, salt and cinnamon. Add cinnamon to taste preference - if you really like cinnamon do 3 teaspoons and less if you like it less. Slowly add the dry ingredients to the wet ingredients and beat until just combined. Over-beating or over stirring will result in a denser bread. Stir in the shredded zucchini and vanilla. Add mixture to the bread pans - both should be about 3/4ths the way full. Allow to cool for about 5-10 minutes and then remove from the pan and allow to continue to cool or eat it while it's hot! See post for freezing/storing instructions. It looks amazing. Especially that swirl! I love anything with cream cheese swirl. I also happen to want to eat ALL the zucchini…so, together? I am drooling! Pinned! Mmm, I love zucchini bread! It’s my husband’s fave so I should probably make some and send it to him! It looks awesome! I just can’t get enough of all the zucchini recipes I’ve seen this summer. And this bread looks amazing, Chelsea! I absolutely love that you swirled cream cheese in here. Sounds delish! Pinned! Chelsea this looks awesome… looks like a perfect breakfast slice 🙂 Pinned! Another delish way to enjoy zucchini bread. Love it! Pinning (of course). Thanks for sharing a secret family recipe! I can understand why this bread is so popular. That cream cheese swirl is calling my name! Ouhhh I love family recipes!! Love what you did with this zucchini bread…cream cheese is always a favorite to many! The swirl adds enough change, but also holds that special taste of the bread I can imagine! I have never made zucchini bread! Clearly I need to change that. Also, the muffins sound great for a breakfast or snack on the go 😉 Thanks Chelsea! Great idea swirling cream cheese in zucchini bread to make it extra indulgent! This looks delicious, Chelsea! What an awesome way to jazz up zucchini bread! You can’t go wrong with anything that involves a cream cheese swirl! Yum! I’ve been seeing tons of zucchini bread recipes but none have convinced me to make them like this one! I love cream cheese and cannot wait to try this recipe. Thanks, Chelsea. 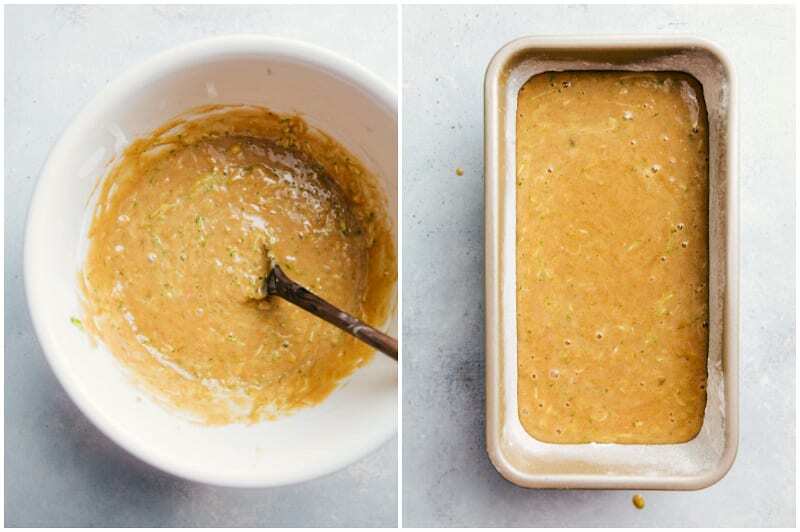 You’re right, this is no ordinary zucchini bread recipe. Oh nah, this is epic. Love your new digs, girl. Oh my Chelsea! This is absolutely over the top. I am so loving it! Pinned! Love a good zucchini bread! And that swirl?? That’s an addition I have yet to try! Pinned! 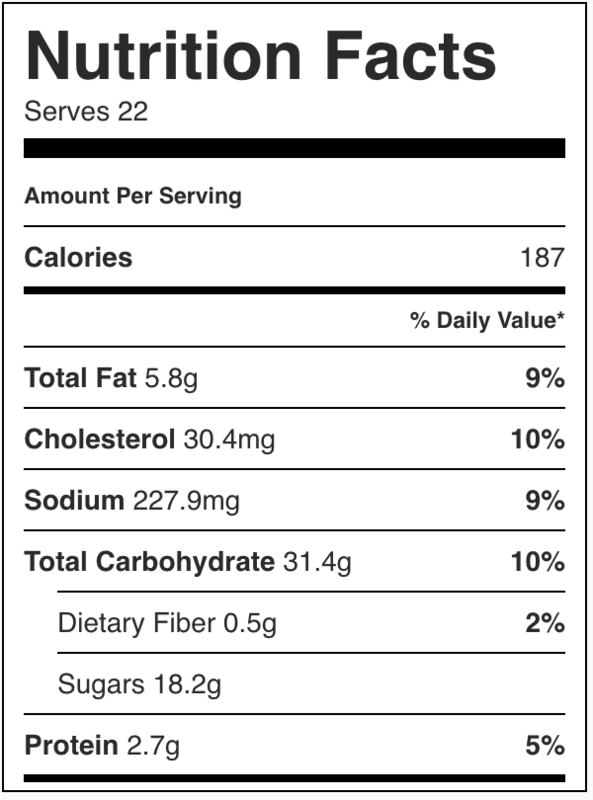 I will be waiting very excitedly for my hunk of this zucchini bread in the mail. 😉 For reals though, Chelsea, that cream cheese swirl takes this bread to a whole new level! 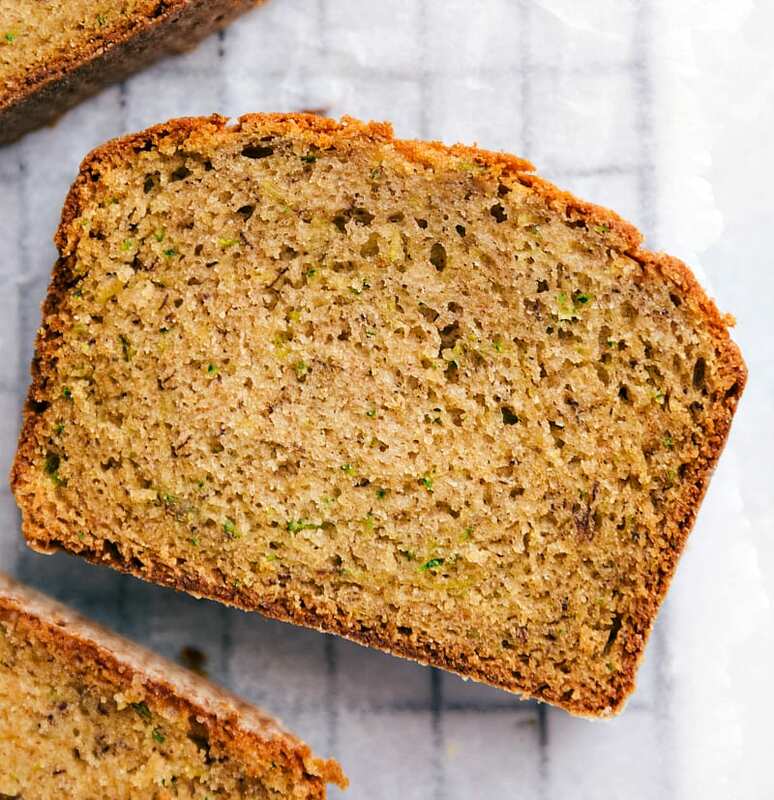 I’m just so excited for fall (even though it’s still august) and the idea of making a nice comforting loaf of this zucchini bread on a cool autumn day has me EXTREMELY excited to try it out! I’m hosting a brunch for some of my husband’s work colleagues later this month – I wanted something sweet and fancy-ish and you have NAILED it. I cannot wait to make this for everyone!!! Absolutely amazing! I bake a lot especially zucchini bread this time of year and this is by far the best bread I have ever had! Made it GF also and it turned out fantastic. Thank you for such a great recipe! It is delicious but I would like to know if you can freeze it. I would like to make some ahead of time and freeze for the holidays. Hi Debbie! I actually made tons before my wedding and froze it. It thawed out great! What a great idea for the holidays!